With baseball season just getting started, you may be looking for a way to keep track of all the scores and stats from your Windows Phone. If so, take a look at MLB Pro '12. 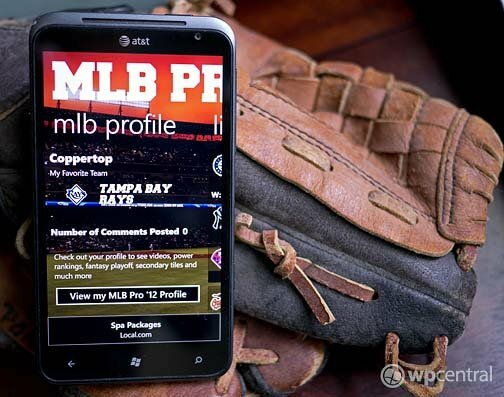 MLB Pro '12 is a new app available on the Marketplace that delivers a significant amount of baseball stats, scores and news to your Windows Phone. Fantasy Playoff Prediction: Personalize your own fantasy playoff prediction and pick who is going to win the MLB World Series this year! and compare it to everybody else's prediction. It would be nice if there was more fantasy team tie in (tracking stats on your fantasy team for example) but the playoff prediction adds a nice change of pace. Favorite Team: Follow your favorite team and gain easy access to your team page. Live Tile: Pin as many teams as you want on your start screen and get a glance at their next game. Deep News and Roster: Check the latest news for every team in the MLB and full roster with detailed information about all players. Latest Videos and Podcasts: Check out the latest videos and podcasts about the MLB season. Live Sports Talk: Share your comments and knowledge with everybody else at your Team's Page and talk trash at the other team's pages. To get the most out of MLB Pro '12, you will need to create a MLB Profile (free) where you identify your favorite team and create a nickname (used in comments and for the Fantasy Playoff Prediction). Once you create a profile, you will have access to MLB videos, podcasts, news headlines and the fantasy playoff challenge. All in addition to the scores, standings, stats and player information that spans the main pages of MLB Pro '12. Overall, MLB Pro '12 delivers a ton of baseball information to your Windows Phone in a nice, clean user interface. The player stats are about as extensive as you will find covering field stats to player salary. My only nit is that MLB Pro '12 really needs a "home" button that will take you back to the main pages. You can drill down a good ways and the only way to get back to the main pages is several strikes of the back button. If you are looking for a way to keep up with Major League Baseball from your Windows Phone, MLB Pro '12 is worth a try. 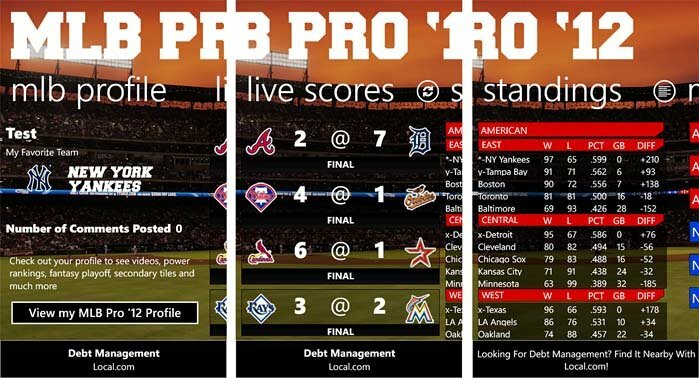 It is a free, ad supported app and you can find MLB Pro 2012 here at the Windows Phone Marketplace.